Branded Buses get your message across. If you are proud about something, let everyone know with a giant message on the side of one of our branded buses. We’ve been vinyl wrapping and branding buses for some of the most famous brands and clubs, parading their messages on London’s crowded streets. Our digital print specialists can create giant high resolution images to over-wrap, one or many, buses as part of your campaign activity. Having your company logo and advertising on the side of our buses while they transport your clients or colleagues to your company event is a great way of getting your brand and corporate message seen. 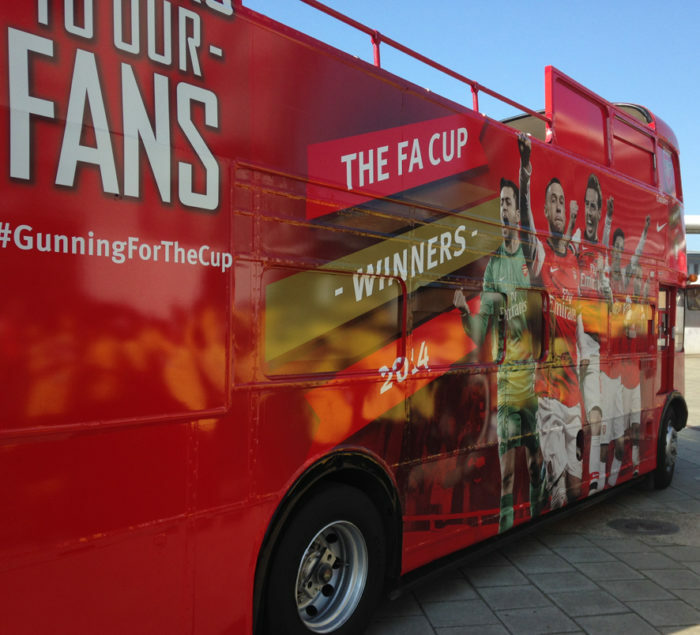 Branded bus advertising will re-enforce your marketing activity with eye-catching impact. We have various branded bus packages from lower cost bus side advertising right up to fully wrapped buses in your corporate colours. Say it big and loud with Branded Buses! Big is beautiful, especially when it’s on the side of a London Double Decker bus. A branded bus can be the centre piece of your campaign, eye-catching and highly visible. It moves too, so reaching a wider audience becomes an easy and fun way to communicate. Branded bus advertising is an extremely cost effective way to reach out to a large number of people. If you are attending an outdoor event or sporting occasion branded buses can get you there and back in style and will continue the work communicating your message to everyone else attending the event.